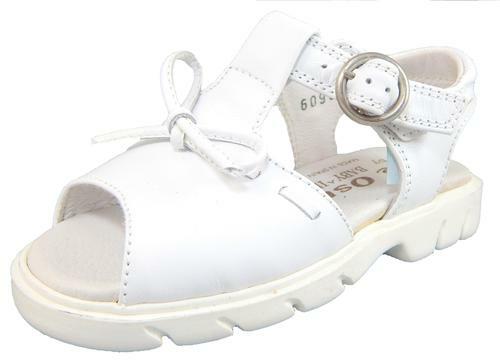 Girls' classic sandals in premium white leather with self-leather bow. Handcrafted in Spain using top quality components. 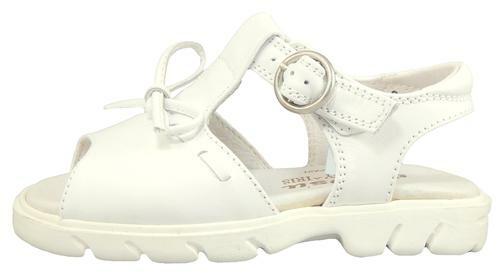 For comfort - full leather breathable lining and cushioned insole. Sale. MSRP $89.50. FITTING: Shoes vary so please compare foot length with insole measurements, allowing 3/8"+ for wiggle room & growth - consultations always OK: EU 22/US 6 = 5 1/2", EU 23/US 6.5 = 5 3/4", EU 24/US 7 = 6", EU 25/US 8 = 6 1/4", EU 26/US 9 = 6 1/2", EU 27/US 10 = 6 3/4", EU 28/US 10.5 = 7", EU 29/US 11.5 = 7 1/4", EU 30/US 12.5 = 7 1/2", EU 31/US 13 = 7 3/4", EU 32/US 1 = 8", EU 33/US 2 = 8 1/4"